I just remembered something important. . It has been 10 years since t h e Cardinals defeated the Tigers in the World Series. Did I ever tell you that I live in the Chicago area? Probably. Did I ever tell you that I am an incurable St. Louis Cardinals baseball fan? Undoubtedly. Saturday night, my feet suddenly felt ice cold, as in “hell just froze over” cold. That can only mean one thing and one thing only. Only one. Did I ever tell you something using the words ‘one’, ‘only’ and ‘thing’? Of course. The Cubs won the NLCS and are on their way to the World Series. I was afraid to go to church last Sunday morning. It was not because it was sell your house and follow me Sunday. It wasn’t. No. There was a distinct possibility that church attendance would be drastically reduced. After all, the rapture certainly occurred overnight and the world was about to end. That will only occur if the Cubs actually perform the impossible and win the Series. My next door neighbors are absolutely koo koo. Nuts. Hog wild excited. The other night, they brought ‘Cub cakes’ to me — chocolate cup cakes with white frosting and a big blue W on top. It was Be Nice To Someone Whose Team Is Not In The Playoffs For The First Time In Six Years day. I think they were hoping their kindness would break the Cubs out of their scoring slump. Apparently that worked. Tonight, while I was mowing the lawn, my neighbors suddenly emerged from their house, yelling and screaming and waving a huge white W flag while marching around me. Cub fans are a little dense. Never taunt an angry man who is pushing a gas powered machine with whirling, sharp blades. Now they have placed a little white W flag on the fence facing my house, a solar spotlight illuminating it so I can enjoy viewing it all night. Yay. Yippee. Lest any one forget, I have failed miserably in raising my son. He is a Cub fan. I knew that this time was coming. The Cubs were too good last season, barely missing the World Series. I imagined escaping to a remote island on the Pacific, a refuge from the heckling, scantily clad island girls feeding me grapes and bringing me Coronas. What I have discovered by weathering the storm is that this might be one of the most pleasant experiences that I have ever had, rivaling the celebrations I have had watching my Cardinals winning the World Series multiple times. Seriously. Cub fans are ecstatic, civil, giddy.. and it is truly enjoyable watching them celebrate. I haven’t missed an inning of the Cubs’ playoff games the past few weeks, doubt that I will miss a World Series game. This is fun. It really is. Don’t expect me to go overboard. I would rather WATCH the celebration, not actually declare my love for the team. See you at the end of the world. It could be coming reaaaaaaaalllllll sooooooon. There is nothing better than enjoying God’s magnificent creation with friends. Even better is rolling through God’s green (and a bit yellow with mixed reds/oranges) wonder.. fast. This past weekend I joined my friends Mike, Mike, and Jon for a jaunt through the twisting, undulating (cool word, eh?) 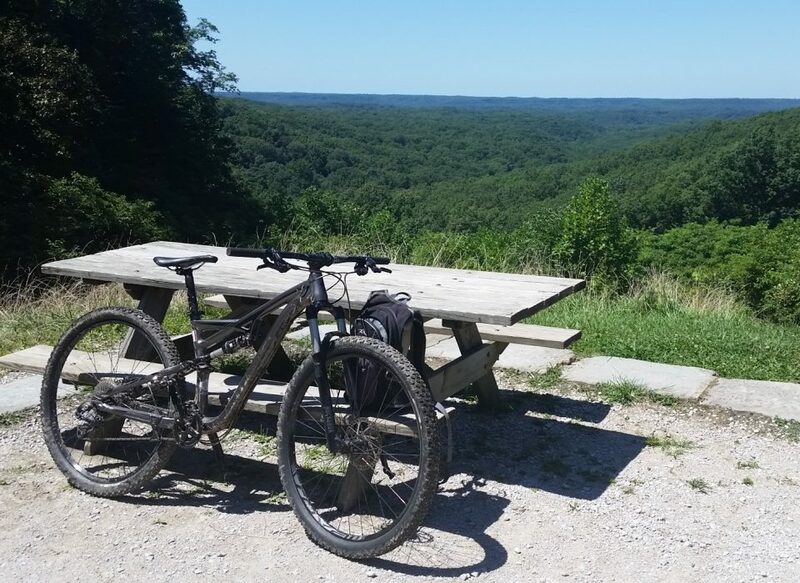 dirt mountain bike trails of Brown County State Park, Nashville, Indiana. Brown County boasts some of the best singletrack dirt trails in the Midwest, a designation that my friends and I heartily endorse. This was my fifth trip to Brown County with Jon — the first trip there was one of my first real mountain bike excursions. That first year was eye opening, my awe evident to Jon and our friend, Jim, who both love introducing the sport to friends. Brown County had been an annual trip each Fall for my two friends, a tradition that Jon and I have continued. Jon and I coaxed my friend Mike into going with us two years ago, easily hooking him to the rush of the trails. Last year we introduced Frank to Brown County.. he was almost in tears as he had to announce earlier this week that his boss had asked him to forego the trip in lieu of a work trip. Jon brought along his friend, Mike B, for this trip, an enthusiastic intermediate level rider who immediately expressed his joy as we entered the woods to begin our two days of riding on Thursday morning, starting at the “bottom” of the park from the north entrance parking lot of Brown County State Park. That portion of the trail, the Pine Loop, begins by winding up a beautifully wooded ravine then through a sweet smelling pine forest, emerging to cross a small wood bridge into a fast flow trail. Pine Loop is a smooth beginner trail with enough twists, turns, climbs, roots, and rocks to give a preview of what is to come. We had already taken a 7 mile warm up loop while Mike B was on a work conference call from his car in the parking lot, so the three of us were able to give him a nice fast intro to the trail. Of course, Mike B had a very interesting crash later on while riding the Walnut trail, something he recorded from his GoPro camera mounted below his handlebar. The link is below. Somehow, he came out of that scary crash as enthusiastically as he had approached our ride all day, with a laugh and a smile. We all were really glad that Mike B joined us this year! His crash became the talk of the rest of our trip. Our first day found us grinding the climbs before flying (literally.. both tires were off the ground a ton during the descents on that trail) the Green Valley trail, grunting the climbs over the roots and rocks of the Hesitation Point trail.. to be treated to a spectacular view at the top, then the rush of the advanced skill level Walnut trail. We reached the top of the park after another screaming rush riding the flowy Limekiln trail to the campgrounds. At the campground, we met up with three other friends who rode back down through Limekiln and Walnut with us to Hesitation Point. Those three rode back up to the campground to get cleaned up for dinner while we rode back down the Hesitation Point trail to Aynes and back to the north gate parking lot. Mike L and I decided to ride our bikes from the trail head to the hotel where Mike B and Jon met us. All said, our first day was nearly 40 miles of dirt trail riding. All retreated to our rooms, exhausted but extremely satisfied, the showers bringing us back to life. We met the three from the campground at the Big Woods brewery in Nashville, closed out the restaurant, sharing stories from our trail rides that day as well as ride stories of the past. The next morning I woke amazingly refreshed, a bit sore from the previous day’s ride, but ready for another few hours of riding. After all, riding was our reason for our trip. None of us are partiers. We wanted to ride as much as possible. After a breakfast of sausage and fake scrambled eggs in the hotel lobby, we left Jon’s van at the hotel, rode into the park for more riding. Our ride started from the Pine Loop trail again, maybe even more sweet smelling in the morning dew. From there the boys coaxed me to ride the North Tower Loop trail, a ride that starts with two miles of grinding, albeit low grade, twisty climbing. My legs were sore. I didn’t want to start with climbing. But I was glad to be talked into riding and leading out on that trail. I was the fastest descender in the group, the climbs warming me up nicely so that when we reached the down and tight turning section of the North Tower Loop trail, I left my friends in the dust, waiting for them with a huge grin at the end of that trail. We ventured back to the Green Valley trail for more roller coaster riding, then climbed to Hesitation Point. From there, we decided to take the park road to the Bobcat Bowl trailhead, a double black diamond expert trail, half of the trail newly finished a week before our visit. Bobcat Bowl is very narrow, following ridges over a whole lot of rocks and roots, with challenging switchbacks that threaten to throw your bike off the trail into the ravine. It’s also one of the most scenic trails in the park.. so wonderful. At one point, I had to walk a small section of trail that was probably three feet wide with a sheer drop off on my left. I am afraid of heights! The trail starts with a challenging, rocky switchback that leads to off camber, narrow dirt trails. It is a fun trail, but I found myself wishing I lived close enough to learn to ride Bobcat Bowl properly. I rode the first half very well, fast enough to take a break in the middle to wait for my friends to catch up. Once we got to the newly finished portion of Bobcat, where it begins to wind up the side of very tall ravines, I fell behind and had to walk some sections. We were a few hours into our ride and I was beginning to show some wear. Plus, I am heavier right now than I have ever been and it began to show in the climbs. Here I am getting ready to negotiate a tight turn on Bobcat. We finished the day by riding back down through the Aynes Loop. At the end, I found my second wind, leading us back to the park, forcing a large group of slower riders to give up the trail to us, allowing us to pass. We sprinted for the old covered bridge at the entrance to the park, then rolled back up the highway to our vehicles at the hotel. I want to go again next week. It was that good! If you have some time and want to get an idea of what the Walnut trail riding was like our first day, here is Mike B’s video. I am the orange guy at the beginning and the end. At 4:39, you will be treated to Mike’s end over into the ravine! Yesterday, I chose to be an adult. It doesn’t happen often. A little of the choice happened by accident, by circumstance. I bought new tires for my mountain bike Friday evening on the way home from a ride, in a rush, and didn’t buy new tubes (I should go tubeless). While changing tires, I punctured the tube. Sooooooo, Saturday morning, I had to wait for the bicycle shop to open before I could fix the flat tire. Thus, I made an adult choice as a result. I actually did my chores before riding. Usually, I ride then chore. After all, playing is far more important and most the time I have enough energy left after playing to work. The bicycle shop opened early, so I had new tubes in hand by 8:30 AM, but instead I went home without riding. The lawn was mowed, trimming done, driveway edged and cleaned, then the asphalt sealed. By 2 PM, I was done with chores. Time to play. And I did. 15 miles of dirt single track, enough to work out the soreness from the chores as well as work out the tightness from the previous two days of riding. It was a beautiful weekend here in Chicagoland. Stevie played. I tried to take a rest day today, but the weather was just too nice to waste. More singletrack this afternoon. I am tired. My muscles are pleasantly worn out. With my annual mountain bike trip with my friends coming this Thursday and Friday, this weekend will have helped get me ready. That’s right… more play for Stevie is coming SOON! It wasn’t as painful as I thought it was going to be. All day I thought about it, tried convincing myself that I used to do it every day, religiously, almost to the point of addiction. Really it is not something terrible, not at all, I just have found something so much better. Besides, I don’t rock spandex like I used to. Tentatively, I mounted the old titanium steed. I wasn’t quite sure that I remembered what it was like to ride a road bike. Would I make mistakes? Maybe I would fall over? Looking at the tight bib shorts, I almost felt exposed, my man bits displayed for all to see. Man bits. Yes. I said that. Stepping into the Look pedals was a bit (not man bit) awkward at first. The SPD cleats that I used with my mountain bike pedals are smaller, a simple step in. If you don’t hit a road pedal with the cleat at the proper angle, it doesn’t always engage cleanly. Dealing with drivers also took some getting used to again. After a mile, a driver passed me on the left as I was entering an intersection, then turned right immediately in front of me, the car leaning so much into the turn that the tires were squealing. I do not miss interactions with cars and rude drivers. Not at all. I maintained a respectable 18 mph average for 15 miles. Not terrible. I could do this again, but, well, the trails will not be muddy tomorrow…. What do children statues do when they want to rebel? Apparently they try cigarettes! Tomorrow is October 1. I have had one month without the worry of my 17 year old son driving my car, due to his breaking the rules of driving my car. I let him have the car tonight. He just got home. It’s in one piece. No dents. No tickets.